Highly desired Desert Shores a Summerlin community offering a genuine oasis in the Las Vegas Desert. Desert Shores takes you out of the common look a like community’s by offering wide heavy tree lined streets along with a giant lake that sprawls and twists around the entire community. Desert Shores has both gated and none gated community’s, both mid and high end homes. Lake frontage homes are present along the entire Lake. ROCKIN THE HOUSE realty will negotiate a great deal on any home that is for sale in the MLS for Desert Shores communitys. Desert Shores homes for sale below. Tournament Hills Summerlin Luxury estate for sale. European style estate with 20,000 sqft! 8bed rooms 13 baths. Property features, indoor spa, fitness center, pool, sauna. Theater room, elevator, extensive detail in every room. 200 year old stain glass and of course the limo deep 4 car garage. Two large master bed rooms. Golf course frontage lot along with Las Vegas strip views from the balconies. Outdoor pool. Over an acre lot. with 2 guest homes. Guard gated community with a public park across the street. 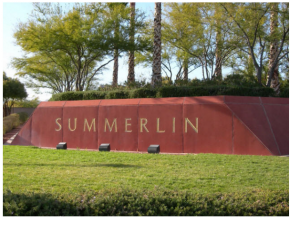 Tournament Hills Summerlin a golfers delight with a striking master planed community located in the heart of Summerlin. Contact broker Jonathan Abbinante for a private viewing of the estate.